Thank you for taking the time to post this data. 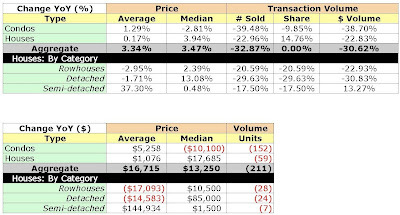 Sales are down considerably, which is a leading indicator of lower prices. Home sellers don't immediately lower prices in reaction to diminished demand; rather, sellers hold out in hopes that one of the fewer byers will fall in their lap and offer the desired price. In that regard, what is the inventory in relation to last year? Once we hit 8+ months supply, prices will start to slide. Excellent information. I would like to point out a recent sales at a loss at one of the new buildings, the Matrix. Unit 607 was sold by the developer to the buyer in July 2007 for $510,000. The original price was an astronomical $667 psf. The buyer, I believe, said he must leave town. The original selling price was $496,000, but this is now reduced to $440,000. (MLS ID# DC6624206). That's a loss of $40,000 in six months. The new price is $575 psf, which is unfortunately still a high price. The good: this unit is right on 14th Street with a great view. 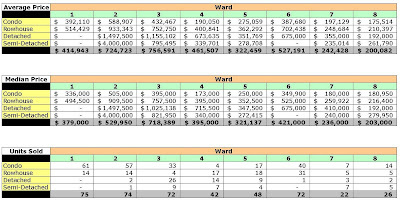 I have done an analysis of the prices at the new developments still for sale. 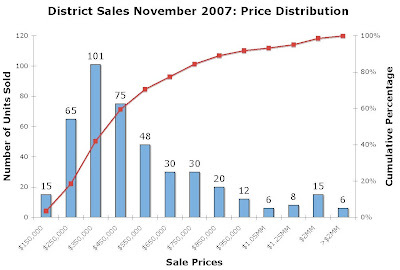 Interestingly for those units that closed in 2005 and 2006, the developers such as Metropolis and PNHoffman seemed to sell for around $450-$500 psf, before the units were flipped during the last days of the frenzy when prices rose 20% per year. Apparently the developers think they should make more money than they did selling premium units in 2006, trying to sell at almost 4600 psf. 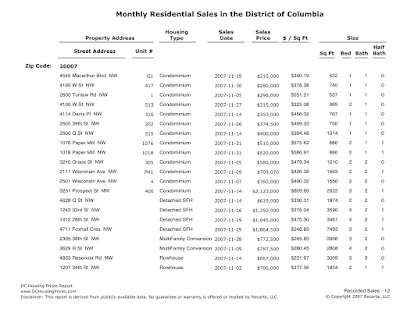 Before the boom, new condo prices were in the $400 psf range in Washington. 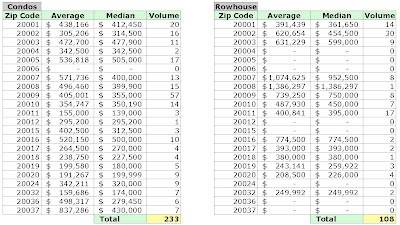 December 2007's MRIS data shows a 6.19 month inventory for homes and 6 months for condo based on that month's sales. 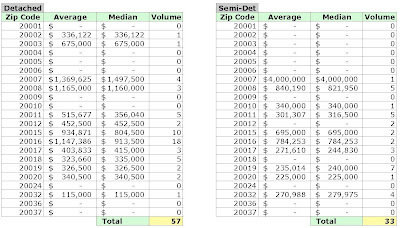 Active listings in that month are slightly higher than that of December 2006, 2880 vice 2781. However, December 2006's condo inventory stood at 4.92 months compared to the aforementioned 6 months, so it's a little worse now. The "stickiness" of sales prices has been mentioned in a number of articles, I believe I posted a blog about it a few weeks ago [entitled "Stuff's worth what it's worth" or something like that].